Boston Teen Acting Troup Spoofs "Peanuts" in "Dog Sees God"
Snoopy is dead, Lucy is in jail, Sally is goth, Linus is a pot-head, Peppermint Patty and Marcie are alcoholics and Charlie Brown is questioning his existence. The Peanuts gang has been turned upside down in Bert V. Royals’ dark comedy "Dog Sees God," coming August 10 - 12 to the Cambridge YMCA Theatre located at 820 Massachusetts Avenue in Cambridge. The Boston Teen Acting Troupe production focuses on the raw uncensored life of high school students. Under the artful direction of METG-Award winners Jack Serio and Catherine Spino, the completely teenage cast of Kevin Paquette, Julia Budde, Nate Guevin, METG-Award winner Philip Da Costa, Brendan Caulfield, Elizabeth Stanfield, Amelia McLaughlin and Julia Clark create Charles Shultz’s classic comic strip characters, aged and thrown into Bert V. Royals’ high school atmosphere in a show the New York Post called "Inventive and raunchy…hysterically funny." This unauthorized parody of the popular "Peanuts" gang follows the strip's beloved characters into adolescence, where their neuroses have developed into violence, sexual confusion, drugs, and more. When CB's dog dies from rabies, he begins to question the existence of an afterlife. His best friend is too burnt out to provide any coherent speculation; his sister has gone goth; his ex-girlfriend has recently been institutionalized; and his other friends are too inebriated to give him any sort of solace. However, a chance meeting with an artistic kid, the target of this group's bullying, offers CB peace of mind and sets in motion a friendship that will push teen angst to the very limits. Drug use, suicide, eating disorders, teen violence, rebellion and sexual identity collide and careen toward an ending that's both haunting and hopeful. Similar to earlier BTAT productions, the company will be donating a percentage of their profits to a deserving charitable organization. 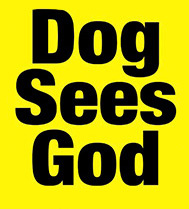 "Dog Sees God" will be raising money for The Trevor Project, a national organization that operates the only 24/7 crisis line for lesbian, gay, bisexual, transgender and questioning youth (LGBTQ). It provides lifesaving and life-affirming resources to teens, with its crisis intervention lifeline, digital community and advocacy/educational programs. Founded in 2011, The Boston Teen Acting Troupe prides themselves in performing professional quality teen theater productions. For tickets and information, visit www.bostonteenactingtroupe.com..